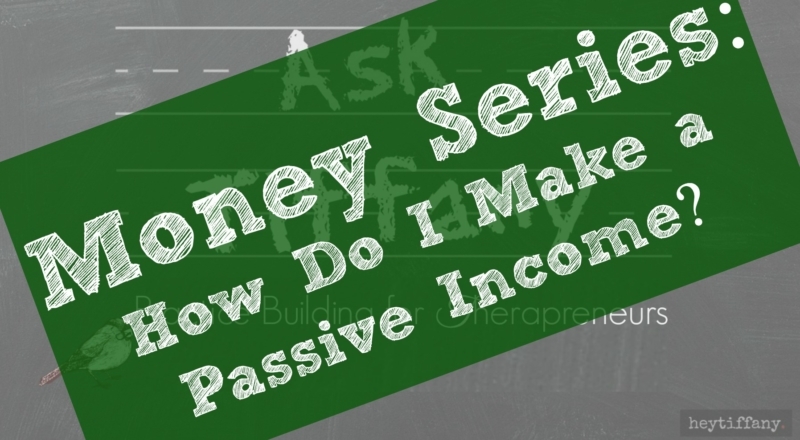 Ask Tiffany: How do I Make a Passive Income? I recently put out the call for your money questions and boy HOWDY did they roll in. I’m going to tackle them one by one, as many as I can muster over the next few weeks. How do I set fees for groups? How do I set fees for presentations or workshops? Loved your fee setting worksheet and video. Thanks!!!! I love the honesty, Tiffany! So many people make it seem like a passive income is so easy and you can just wake up each morning, look at your phone and see that you made another $500 overnight while you slept! I appreciate that you admit to everyone that it’s hard work and you really have to grind in order to get there, but that it’s possible if you want that life for yourself (which not everyone does). I also really like the advice about surrounding yourself with supportive people. This is so true! No matter what you want to do as a therapist (individual sessions, group, consulting, large events, getting paid to write, passive income strategies, etc.) there will always be people who think you shouldn’t or that it’s a bad idea or that’s not what therapists do. But if you surround yourself with the right people, you’ll have the support to keep moving forward with whatever that goal might be. Thanks for taking the time to share your perspective – especially because you ARE one of the therapists who is busting your behind to get to the next level. It’s not easy and it’s not for everyone, but – just like you say – when you find your tribe and they are invested in building and growing in similar ways, it actually becomes a way to connect and bond.